The interfaces between the two oxides (represented in this idealized, atomically abrupt model by the yellow and purple bands) create an electric field. 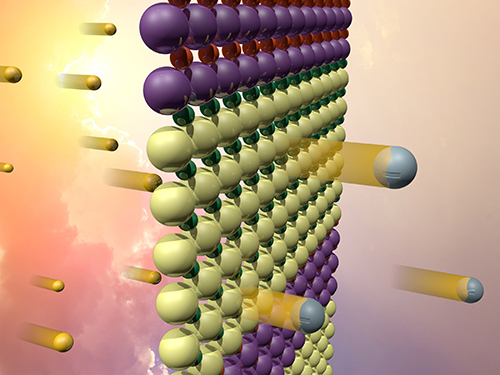 The field separates electrons (silver) excited by sunlight (gold), which could be used to catalyze hydrogen fuel production. Enlarge Image. Nobody wants a laptop computer that stops working when a cloud passes by. 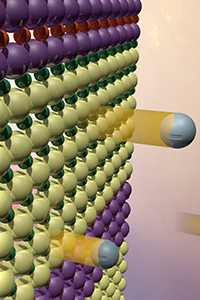 Storing sunlight as fuel that can be later used to drive fuel cells requires new materials. Scientists demonstrated such a material. They combined two oxides on the atomic scale. The interface between the oxide materials, one containing strontium and titanium (SrTiO3) and one containing lanthanum and chromium (LaCrO3), absorbs visible light, producing electrons and holes that might be useful for catalyzing reactions, such as producing hydrogen fuel. However, if there is nothing to pull those electrons and holes apart, they will quickly annihilate one another without doing anything useful. By carefully synthesizing this material as a series of alternating layers, the international team created a built-in electric field that could help separate the excited electrons and holes and improve the material's performance as a catalyst. Why It Matters: This material opens up new scientific frontiers to solve a persistent energy challenge: storing solar energy for later use. Fuel cells capable of running on hydrogen fuel created by solar energy could allow people to heat their homes and run their computers on solar energy even in the dark of night. Methods: By depositing thin layers of SrTiO3 and LaCrO3 on a crystalline substrate, the investigators at the Pacific Northwest National Laboratory, Argonne National Laboratory, SuperSTEM, and the University of Oxford controlled how the ions at the interfaces bond to each other. This allowed them to engineer an electric field in the material that can be used to separate electrons and holes. Using X-ray spectroscopy techniques, they confirmed that the electric field was present and that the ions in the material shift positions as a result. Ultra-high resolution measurements using an electron microscope helped confirm this ionic shift. All of these experimental results were backed up by computational modeling of the materials, which predicted behavior in excellent agreement with what was observed. The electric field in these materials is present because the researchers were able to precisely control the growth process so that each interface has either a positive or negative charge. Alternating positively and negatively charged interfaces in the material produce nanoscale electric fields that can interact with the electrons and holes that are excited by solar energy. Electrons may then be driven to the surface, where they could interact with water molecules to break their bonds and produce hydrogen fuel. What's Next? Researchers are continuing to explore the properties of these superlattices using cutting-edge X-ray measurements at synchrotrons around the world and using other advanced microscopy techniques to look at the chemical makeup of the interfaces. Sponsors: Film synthesis and characterization was supported by the Linus Pauling Distinguished Post-doctoral Fellowship at Pacific Northwest National Laboratory (PNNL Laboratory Directed Research and Development). The microscopy work at Pacific Northwest National Laboratory was supported by the U.S. Department of Energy (DOE), Office of Science, Office of Basic Energy Sciences (BES), Division of Materials Sciences and Engineering. The computational modeling at Pacific Northwest National Laboratory was supported by the Laboratory Directed Research and Development program. Sector 20 facilities at the Advanced Photon Source (APS), and research at these facilities, are supported by the DOE BES, the Canadian Light Source and its funding partners, the University of Washington, and the APS. Use of the APS, an Office of Science User Facility operated for the DOE Office of Science by Argonne National Laboratory, was supported by the DOE under Contract No. DE-AC02-06CH11357. Electron microscopy was carried out in parts at the SuperSTEM Laboratory, the U.K. National Facility for Aberration-Corrected scanning transmission electron microscopy, which is supported by the Engineering and Physical Sciences Research Council (EPSRC). The research leading to these results has received funding from the European Union Seventh Framework Programme under Grant Agreement 312483 - ESTEEM2 (Integrated Infrastructure Initiative-I3). In one sentence: By carefully combining two oxide materials on the atomic scale, scientists created a designer interface that separates electrons and holes; this research matters because those electrons could go on to drive reactions that yield hydrogen fuel, essentially converting intermittent solar power into durable fuels.